Advance Tree Service offers tree pest control, lawn infestation, and weed abatement services. Instead of standard spraying practices, the company opts to use environmentally-safe chemical injections and techniques on trees and lawns. Trunk injection is the most effective alternative to spraying or soil applying pesticides for tree insect or pest control. 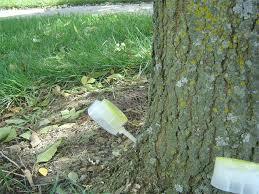 Trunk injection equipment injects formulations directly inside trees. With over 10 years of research and development, trunk injection systems and formulations are proven to give the best results when protecting trees from pests. Trunk injection of trees is a way to efficiently treat many different insect and disease problems, as well as nutrient deficiencies, in a manner that limits environmental exposure. This method also uses the least amount of pesticide as compared to other conventional treatment methods. 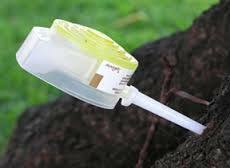 Trunk injection involves using a special injection tool which places and seals the insect control directly into the trunk where it is quickly taken up by the vascular system and distributed throughout the tree. 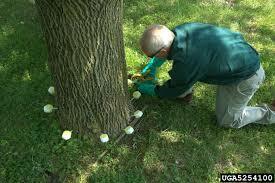 Injections are made in the bottom 18 inches of the tree, at intervals of around 6 inches apart. The depth for the injection is between 5/8” and 1 5/8” into the tree. A 10 inch diameter tree would receive approximately a 1.5 ounce injection for two years of protection.